Macdonald,A (2017). Going nowhere: Screendance and the act of dying. International Journal Screendance. 8. Macdonald, A (2014) Structure, Familiarity and Endings in Hart, A (ed) Parts Per Million: An illustrated Glossary of Public Art, Central St Martins University Press, London. Macdonald, A (2013) Things that start slowly, in Turner, J, Shirley, D (eds.) 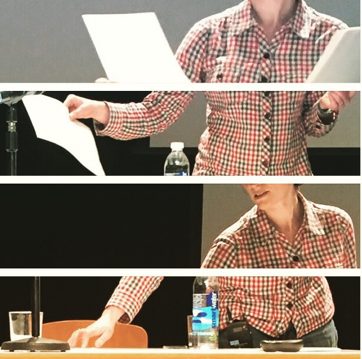 Performing Narrative: narration, ‘‘denarration’’, fracture, and absence in contemporary performance practice. Manchester Metropolitan University Press, UK. Macdonald, A (2013) I Will Not Hope: Interview, Videofocus13, July, Stigmart Press. Macdonald, A (2013) Editing I Will Not Hope, Choreographic Practices Journal 4:2. Contingency, containment and curation at Expanded Practice and Curation as Creative Process: An International Symposium at MMU on Feb 26th/27th. Maternal Creativity conference: Southbank University, London, July. Striking through: writing practices and research integrity - co-authored with Prof. Jacob, Keele at Risk and regulation: Arts and Medical Humanities Conference at Dartington Hall, Falmouth, June. Contingency and structure in the screendance edit: Analysing I will not hope at Lightmoves International Screendance Conference hosted by University of Lymeric with Dance Limerick and DMARC (The Digital Media and Arts Research Centre). ‘This is for you: witnessing the street’ at ‘The street as a choreographic space: receptions, participations and transformations’ in June 2014, hosted by The CETAPS laboratory, University of Rouen and Atelier 231 – National centre for Outdoor Arts in Sotteville-lès-Rouen.